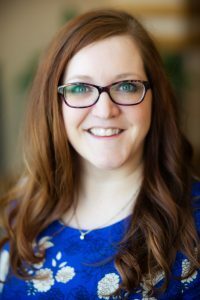 Meet Amber Foster, FWCC’s Managing Director. A transplant from Illinois, Amber is a staunch advocate for our city and gives back by volunteering for a variety of organizations and causes. She earned a Master of Business Administration from Indiana Institute of Technology and a Bachelor of Arts in English from Northern Illinois University. She is also a freelance writer for whatzup Magazine, Visit Fort Wayne, and Northeast Indiana Public Radio. In 2010, she was named one of our community’s top 40 Under 40 and a Top 100 Connector in Northeast Indiana. Her most important role, however, is mother to her daughter Annabelle and her three dogs: Max, Lenora and Frankie. 1- How long have you been with FWCC? I joined the team in March of this year, making me the newest member of FWCC! 2- What do you like best about working with FWCC? From day one, I could tell FWCC was special. Everyone, from staff, to volunteers, to parents and singers refer to the organization as a family, and that permeates every aspect of this job. 3- What is your favorite FWCC memory? Since I have been here only a few months, I don’t have too many memories, but two moments really stick out. The first concert I attended was the Young Artist Concert this spring at First Wayne Street United Methodist Church. This concert featured Concert Choir, Youth Chorale and Chamber Singers. I was moved to tears by how beautiful they sounded in that space. Angelic is an appropriate word to describe it. My second favorite memory was being a part of auditions in May. Nancy and I ran the parent information meetings, and I enjoyed meeting all the new parents and walking them through what they can expect should their child choose to join FWCC. Many people don’t realize that our music education program is second to none. We teach our singers to read music just as if they were reading a book. Mr. Busarow can hand them a piece of music and they can sing it without accompaniment. It’s quite astounding. 4- How would you describe the culture of FWCC? As I mentioned above, family! We truly are a family. We look out for each other and celebrate each other’s successes. We spend a lot of time with our singers and we walk alongside of them as they grow through our program. During my short time here, I have met so many singers and alumni who have shared their stories about how FWCC has impacted their lives. It is inspiring. 5- In your own words, why should a child consider joining FWCC? If your child likes to sing, this is the place for them. Not only will they learn to read music and refine their talent, they will make lifelong friends and development meaningful life skills that extend beyond the choir.